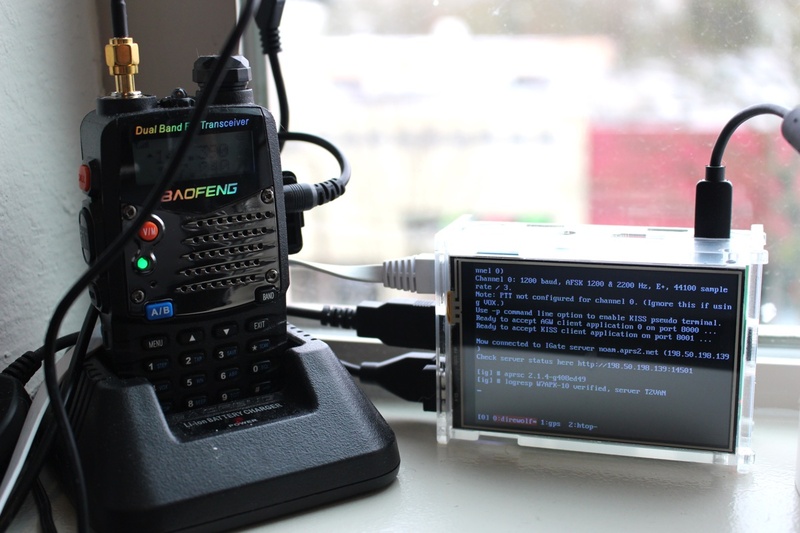 At home, I have a Raspberry Pi connected to a Baofeng UV-5R running the Direwolf software listening for APRS beacons in the area. So far, I've seen a half a dozen or so people driving down I84 as they pass by the Hollywood exit. Here's the aprs.fi report for my home station (and previous call sign) which lists the stations I've heard directly. I also transmit APRS beacons from my handheld on occasion. You can see my last reported location here. Here are some of the stations that my base station has observed nearby. Full logs. I just set up my Raspberry Pi to act as an APRS IGate transmitter, so that it relays packets on the radio that it receives from the Internet. There were a couple tricks that I couldn't figure out so I ended up disabling it for now and switching it back into just receive mode. Adding those settings quickly turns on a stream of stations transmitting through mine! I then plugged the headphone jack of my USB audio adapter into the Baofeng radio, and enabled VOX. I don't have a PTT circuit set up yet, so I had to rely on VOX. Here's where it got messy. With squelch disabled, the VOX would never trip and I would never transmit. I had to turn squelch back on. I wasn't able to keep both the headphone and microphone jack of the Baofeng connected, because it created some sort of loop where it kept the radio transmitting even when there was no audio. For testing purposes I used two separate Baofengs, one to transmit and one to receive. I also had to mute the loopback audio from the Pi, otherwise anything that came through the mic was echoed back out the headphones and transmitted! To do this, I launched alsamixer and muted the microphone, which just disables it from being heard in the headphones but still is heard by Direwolf. Next time I try this again, I want to set up a proper PTT circuit so that I can use just one Baofeng. Hopefully I can get this to the point that I can launch it with a real antenna and be a helpful local digipeater!